Yakuza 0 Review – Money is power. I have to be honest here; I let the Yakuza series slip by me. Actually, that’s an understatement. I deliberately ignored its existence based on a baseless assumption about what a game called Yakuza must be like. I regret it. I caught up with the storyline from Yakuza through Yakuza 3 on YouTube, and started the series with Yakuza 4 and Yakuza 5, both great games that shattered my expectations in the best way. Now, a prequel title called Yakuza 0 is here, and of the games I’ve played so far in the series, it is my favorite. This is not a spinoff or a side-story. This is essential Yakuza, and the 6th main game in the series (Yakuza 6, currently scheduled for worldwide release in 2018, will be the 7th). Being a prequel, Yakuza 0 is the perfect entry point for new players, so for those of you that have never played a Yakuza game before, I’ll go over exactly what you can expect from one. 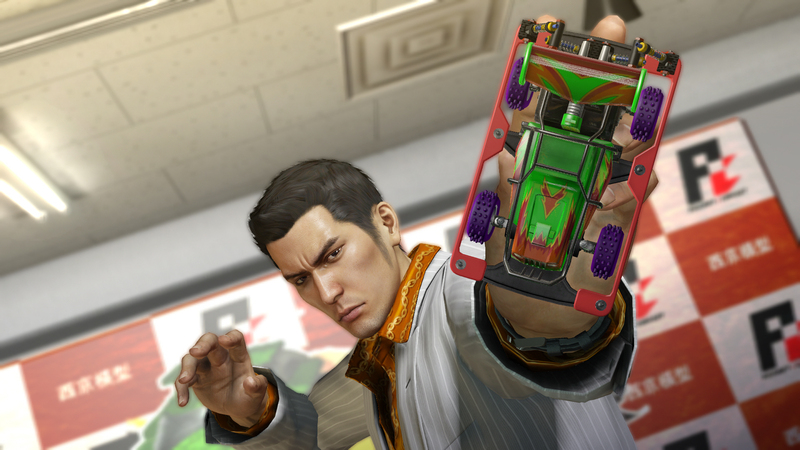 Some might describe Yakuza as Grand Theft Auto set in Japan, but that would be doing the series a disservice. True, there are similarities—both series feature lengthy campaigns starring criminal protagonists, dozens of side activities and distractions, and plenty of gratuitous violence—but the differences outnumber the similarities by far. Whereas Grand Theft Auto includes the entirety of a sprawling city that could be described as an open world, Yakuza games take place in a much smaller space spanning a relatively small number of obscenely detailed streets and blocks. Grand Theft Auto features combat heavily focused on firearms and explosives, and the entire world is your battleground, whereas the battles in Yakuza are brawls that take place in small arenas, and tend to be much more focused on hand-to-hand combat than projectiles. Perhaps the biggest difference is that Yakuza has no vehicles for the player to control whatsoever (aside from the taxi minigame in the first chapter of Yakuza 5), and so the city must be explored on foot. The end result is that Yakuza feels like a much more intimate experience. The Grand Theft Auto games have become so enormous in scale that it’s hard to appreciate some of the little details—especially when you’re driving by them at 90 miles per hour. But in Yakuza, don’t be surprised if you start memorizing the names of streets, parks, convenience stores and buildings. That being said, don’t mistake the humble scale for lack of content; the cities in Yakuza are densely packed with things to see and do, and the games feature lengthy campaigns. I probably spent more time playing Yakuza 5 than Grand Theft Auto V, for example. These are huge games that can easily last 60 hours, or well over 100 for completionists. Yakuza 0 features two protagonists: Kiryu Kazuma, the main protagonist of the Yakuza series, and fan favorite Goro Majima, who is playable for the first time. The game takes place at a time when Kiryu has yet to rise in the ranks of the Dojima family of the Tojo clan of yakuza, and Goro has fallen from grace for acting against his family. Series veterans may think they know these characters well, but they are different in Yakuza 0. Obviously they are younger than we’ve ever seen them, but they are also still in the process of growing into the characters that we know and love. Kiryu is as reckless as always (intentionally springing every trap) but he also seems quicker to anger, and is more vulnerable—if an unstoppable fighting monster like Kiryu can be vulnerable… Goro, on the other hand, is introduced as the pinnacle of classiness and patience, a stark contrast to the character we know from the rest of the series. They both grow into their more familiar roles as the storyline of Yakuza 0 progresses, and I won’t spoil the details, but it was great to learn about these younger versions of Kiryu and Goro. Indeed, it’s safe to say that the character development and story of Yakuza 0 adds more depth and meaning to the events that unfold in the rest of the series, which is all I could ever ask of a prequel. The story takes place in December of 1988, and involves a struggle between several yakuza families over The Empty Lot, a small plot of land in the center of huge potential development project in Kamurocho. Kamurocho is an area in Tokyo and the setting for most of the Yakuza series, and is the city that Kiryu explores in Yakuza 0. Kiryu soon finds himself framed for a crime he didn’t commit, and gets wrapped up in the struggle. Goro, meanwhile, is just trying to get back into the good graces of his family, and is working at a Cabaret in Sotenbori, a part of Osaka. The storytelling in Yakuza 0 is, in my opinion, the best of the series so far. I felt like the story of Yakuza 5 kind of got lost in all of the switching between the five protagonists, and they tried to tie it all together at the end, but it didn’t really work. In Yakuza 0, the story frequently switches between Kiryu and Goro, but you never spend too much time away from either one of them. Things start to tie together in a manner that actually makes sense from a storytelling perspective, rather than just the usual deus ex machina. Don’t get me wrong; there’s still plenty of that, but at least it’s used a bit more sparingly, and the player can instead focus on some real emotional moments. If there’s a miss, it is more in the inconsistencies of the 1980s setting. Sure, there’s a disco and plenty of neon, and the characters—especially the bad guys—dress the part, but the dialogue itself is mostly modern. I guess Kiryu saying “That’s rad!” feels 80sish, but then again, the term “butthurt” is also in the game, which according to extensive research, didn’t appear in the wild until 1998, so, immersion ruined, obviously. Yakuza 0 differentiates itself from the rest of the series in how it handles character development in terms of gameplay. This time around, each protagonist has multiple fighting styles that can be switched between in battle. This keeps things interesting, as you really need to pick the right style for the right fight. Each character has a style that works well against multiple enemies, and styles to deal with defensive or particularly aggressive enemies. Each style can be strengthened individually by literally investing money into the character. This isn’t just chump change, but vast amounts of money—far more than Kiryu ever comes across in the rest of the Yakuza series—that has to be burned to invest in the skill tree for each style. We’re talking literally billions of yen being spent like red orbs from God of War. 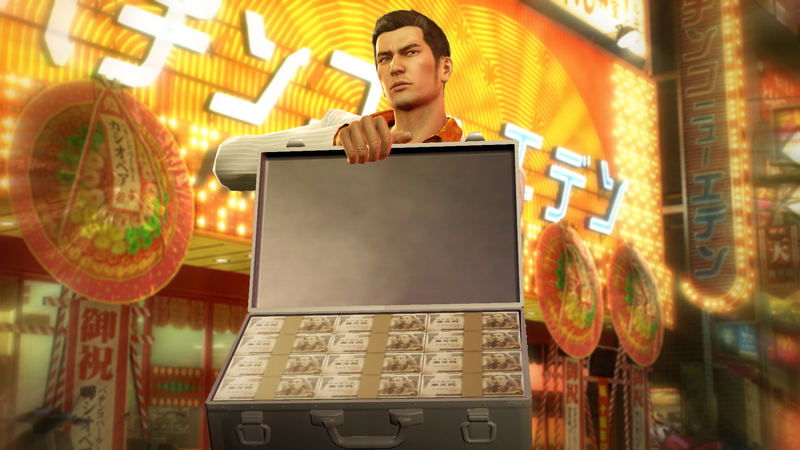 In this case, money is literally power, which connects well with many of the themes present in the story of Yakuza 0. Fortunately, Yakuza 0 presents the player with far more opportunity to earn money than ever before. At first it seems kind of broken when the random street punks you’re fighting drop hundreds of thousands of yen, even right at the start of the game. The scale is just off the charts compared to previous games in the series. Basic items from shops and restaurants are immediately affordable to the point that you can stock up on the best healing items in the game without any consequence whatsoever. They might as well cost pennies. It honestly felt broken and immersion breaking at first. The Yakuza games tend to be pretty realistic, and this is an aspect of the game that is obviously immersion breaking. But from a gameplay perspective, it works. You just have to suspend your disbelief a bit. Eventually each protagonist gains access to a business that proves to be both another money sink, and the main source of income. Kiryu gets to manage real estate, and Goro manages a cabaret club. Both are represented by fairly detailed minigames that probably represent a couple dozen hours of gameplay. The problem (or the depth, if you prefer) is that the player must choose whether to invest in their business or their protagonist, and in my case, the business usual won. I knew that if I kept investing in the business, I could invest in my character at a larger scale later, but I ended getting towards the end of the game with a lot of skills still locked. When I finally maxed out my businesses, I started to invest in my characters all at once, but I would have preferred to have access to more of their skills earlier. At first I thought that there should have been a separate currency for leveling up the characters rather than yen. But as I played the game, and realized how much “money is power” was a central theme, it all started to come together. I mean, sure, it’s not very realistic to punch a guy and watch the money flutter out of him, and the whole concept of investing into the self makes no sense whatsoever, and we’ll kind of have to ignore the fact that Kiryu is basically a millionaire by the time it’s all over but still manages to have no money in all the other games, but… video games… so it’s okay I guess. 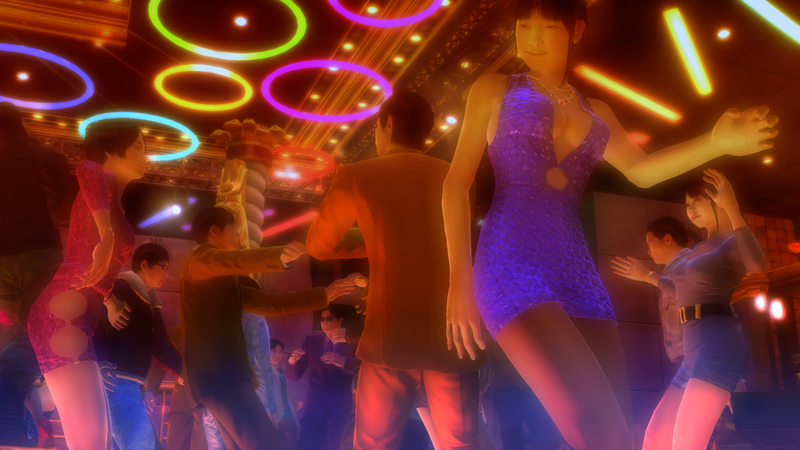 In addition to the aforementioned businesses and their associated minigames, Yakuza 0 contains many of the same distractions as the other games of the series, and a few new ones. The list includes fishing, bowling, darts, pool, karaoke, card games like poker and blackjack, and games I’m barely familiar with like cho-han, cee-lo, koi-koi and oichi-kabu. There’s a new rhythm game that you can play at the disco, and there are also a few more perverted distractions that may or may not severely embarrass you. You can collect cards of scantily clad photos of real women, watch videos of women in a video store, and bet on cat fights, just to name a few. There’s also shogi, a game similar to chess that I’ve always wanted to learn… the game does a good job of teaching you how the pieces move, but fails to really introduce the actual strategy to the player, and I found even the beginner difficulty to be downright punishing. I’ll probably have to study shogi outside of the Yakuza franchise if I ever hope to learn it properly. But this isn’t the first Yakuza game to feature shogi, and it’s quite obvious that a lot of the code was copied directly from previous games… even the NPCs you play against say the same exact condescending lines of dialogue when you screw up. I’m not complaining too much though. I’m just thrilled to see so many minigames included in Yakuza 0. There’s a new one called Pocket Circuit Racing where you can collect cars and components to modify them, and race against NPCs. It’s actually really quite fun, and there’s a large series of subquests involving a cast of characters that exist only for that one minigame. In fact, one of the great things about Yakuza 0 is that if you do choose to allow yourself to become distracted, you’ll find that there is usually more to the minigames than just the games themselves. More often than not there will be associated subquests and storylines, and plenty of variants for the games themselves. Between the strong storyline, the plethora of minigames, the businesses, the fighting styles and the fantastic character development, Yakuza 0 proves to be an essential entry in the series. But what makes it my favorite Yakuza game is how all of the gameplay elements are tied together. The random fights are less annoying because they are so rewarding, and there’s always something to invest money into. The subquests (of which there are 100) end up tying into your businesses, as NPCs you’ve helped decide it’s their turn to help you. The successful businesses lead back into the character development, and so on. And literally everything you do in the game can award completion points, which can be spent on quality of life features and other bonuses. All and all, it’s just a great experience from start to finish, and it’s left me really looking forward to playing Yakuza: Kiwami, the upcoming remake of the original Yakuza. If you’ve never played a Yakuza game before, this is the perfect place to start, and if you’re a series veteran that isn’t overly fatigued, you can consider it a safe investment. Ari completed Yakuza 0 in 71 hours. He received a copy of the game for review purposes from Atlus U.S.A., Inc.